as in these Easter eggs to pan. You can even make half the size and use it as a cake for yourself or for a snack for children, maybe in many different colors! With the ingredients indicated they prepare a dozen from ca. 10 cm Ø. With the same amount, but halving the amount of individual piles, twenty! Stir in the planetary or with a whisk (mean whip to soft dough) the butter into small pieces and softened, sugar, salt and lemon peel; then the eggs. Add, stirring, flour, starch, baking powder and water. Divide the dough on parchment paper or greased plate covered in ten piles. Bake in preheated oven at 200 ° (ventilated 180 °) 15-20 minutes. Place the cakes on a grating, upside down, and glaze them while they cool. Mix the icing sugar, adding the lemon juice little by little. It will have to be consistent but fluid mass. Frosting with the brush one by one on the bottom of the still warm cookies and allow to dry. 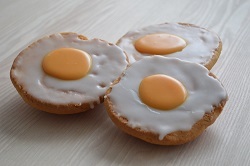 To apply the effect of the egg to the bull's eye - as in the photo - add the yellow colorant to the remaining icing (or prepare a little more) and let a teaspoon of it pour over the solidified white icing! To apply the glaze is best to hold each amerikaner.